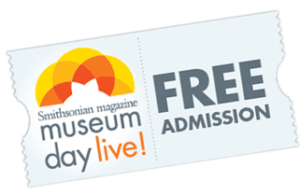 The annual, nationwide Smithsonian’s Museum Day Live event where Museums across the U.S, offer free admission will be on Saturday, September 22, 2018. Museums affiliated with the Smithsonian will offer free admission for two with a Museum Day Live free ticket that you can sign up for at smithsonianmag.com/museumday. St. Petersburg’s Arts Alive also offers free admission, some places have restrictions. How it works: Museum Day is a one-day event in which participating museums and cultural institutions across the country provide free entry to anyone presenting a Museum Day ticket. Participants are allowed to download one ticket per email address. The ticket provides free general admission on Saturday, September 22, 2018, for two people.